Hop into any car and go. The Solvit Deluxe Car Safety Tether lets you bring your dog with you in multiple vehicles with ease. This tether is compatible with all sizes of Solvit’s Deluxe Car Harnesses and integrates with any vehicle's safety system. Constructed from durable materials and a high-strength carabiner, its tested to 2000 lbs and it's adjustable too! So, help keep your pet safe and secure with Solvit. Easily integrates with the seatbelt in your car. The high-strength carabiner allows for extra stability. Compatible with all sizes of Solvit Deluxe harness styles. Constructed from strength-rated materials and tested to 2000 lbs! Adjustable and works in any vehicle. Purchased this because I was tired of buckling in my dogs leash then having him tie himself up in the extra lead. Also did not feel it was safe. He has fallen off the seat a few times trying to jump from one seat to another. This tether prevents that. I can adjust the length so he has some wiggle room but its not a hazard. Problem solved. Shown with the Solvit Car Cuddler car seat (love it) shown in the pic. So far it works perfect. Hopefully I won't have to update about how well it works in an accident ever. This is easy to use. Got a second one so we have one in each vehicle. This is very well made and easy to use. We are pleased! I love how easy this is to use and it was cheap too! 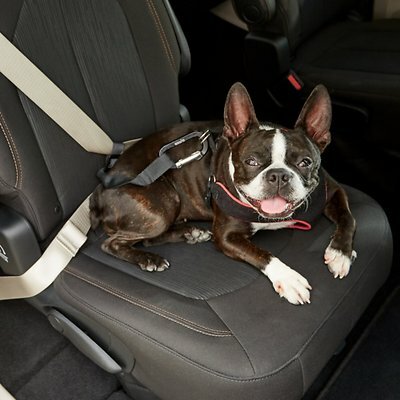 Very strong and sturdy and keeps my dog in the seat and not roaming around the car. Definitely limits front seat activity! Still able to jump into back seat and "hang" herself but is a major improvement over using nothing. Our dogs are great travelers. But one insists on driving. We bought the tether not only for his safety but ours. If we step outside the car, he jumps in the driver's seat and tries out all the buttons. Once I had six emergency vehicles show up after making a call that my dog had locked me out of my car with keys in the ignition, motor running, and purse and phone on the front seat. Got a tether. Problem solved! Item seems sturdy, but the clip is so large, it is hard to fit into my little guy's harness.